Flyers posted around the hospital protesting a potential helipad. 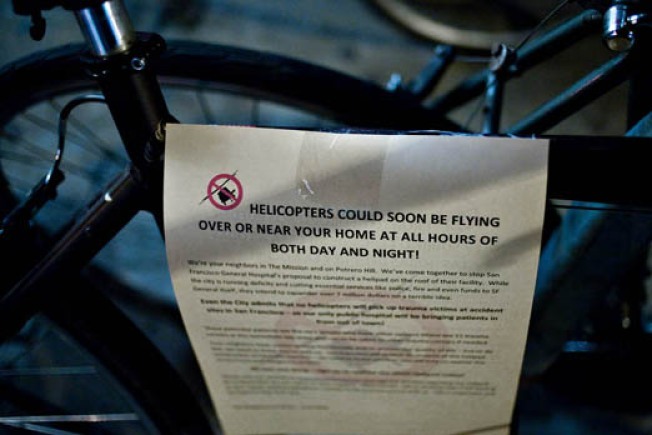 How do you stop helicopters from flying over your home "at all hours of both day and night?" Throw a $100-a-plate dinner. The battle over whether San Francisco General Hospital should be equipped with a helipad to save lives could come down to a ritzy fundraiser. A group of Potrero Hill residents are fighting a state bill that would require the City's only level one trauma center to add a helipad to an a $887.4 million reconstruction of the hospital currently under way. The San Francisco Department of Public Healthtold the San Francisco Examiner there are currently no plans to build a helipad at the hospital. But that is not stopping the Neighbors of San Francisco General Hospital from donning their best clothes and forking over $100 a plate this Saturday to raise enough money to defeat the bill. The association's gripe? Pesky lifesaving helicopters make noise while ferrying the sick and wounded. Even if the neighbors are successful their efforts may be for nothing. In July the San Francisco Board of Supervisors' Land Use Committeegave UCSF the thumbs up to build a helipad of their own at the medical center's Mission Bay campus -- right next to Potrero Hill.